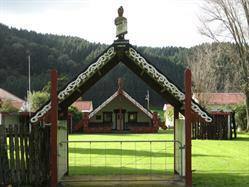 Taumarunui, the meeting place of the Whanganui and Ongarue Rivers, was an important centre in Maori history. A rural service and shopping centre and the largest town in the Ruapehu District, Tamarunui is known for its farming, railway history, trout fishing, gardens and weaving. The golf course is listed amongst the country’s top 50. Taumarunui’s population was set at 5,136 at the 2001 census. However, this figure doesn’t take into account a much larger rural farming community for which Taumarunui is the central hub. The Maori language, or Te Reo, is a melodic and flowing language. When spoken correctly, it is really quite lovely to listen to. Like any language though, there is a trick to pronouncing the words and names in the way the Maori people themselves do. Many non-Maori people struggle with our Maori place names including a lot of New Zealanders! Taumarunui is correctly pronouced Toe-mah-roo-noo-ee. The R sound should be rolled. Easy! Once you’ve mastered how to make these sounds you can pronounce any Maori word you see correctly. Kia Kaha! Be strong and good luck.